The Atlanta Tennis Championships kick off the 2011 Olympus US Open Series and will feature a plethora of top American players competing on home soil, seasoned veterans looking to make a comeback in Atlanta and new young guns trying to assert themselves against some of the world’s best. The favorite to win the title in Atlanta is top seed and defending champion Mardy Fish. The current world No. 9 and top-ranked American first cracked the top 20 after winning the title in Stockholm in 2003. He was the Silver Medalist at the 2004 Athens Olympics, but since then, his career has been anything but steady. Just over a year after achieving this Olympic milestone, Fish suffered a wrist injury that required two surgeries and only allowed him to play 17 matches in 2005. His ranking suffered as a result and by the beginning of 2006 it had fallen to 341. However, in March of that same year, he surprised the field in the Clay Court Championships in Houston by winning the title as a wild card. The next few years saw Mardy fluctuate in the rankings, from a high of 20 to a low of 108, his play was marked by heavy strokes but sub-par speed, which led to inconsistent results. However, the biggest positive swing in Mardy Fish’s career came in the beginning of 2010. He dropped more than 30 pounds and improved his on-court speed launching his all-time best season. He made the finals at Queen’s Club in London and the Masters 1000 event in Cincinnati and won the titles in Atlanta and Newport, boosting his ranking more than 70 spots to No. 19 at the end of the Olympus US Open Series. Continuing that success into 2011, he reached the semifinals in Memphis, Delray Beach and the Masters 1000 event in Miami and matched his best Grand Slam result at Wimbledon, defeating defending finalist Tomas Berdych en route to the quarterfinals. Fish hopes to start the 2011 Olympus US Open Series by defending his title and keeping the trophy in American hands. One of his biggest challenges, both figuratively and literally may come from the 6’8" South African, Kevin Anderson. The three-time NCAA All-American at Illinois has steadily risen in the rankings since making his first ATP World Tour semifinal here in Atlanta in 2010. He entered those championships ranked 90, and today carries a ranking of 35 into the tournament. His powerful serve and punishing groundstrokes won him his first career title in Johannesburg this past January and helped him reach the quarterfinals of the Masters event in Miami in March. As Fish and Anderson are the projected top two seeds, they can only meet in the final, but the rest of the field is intent on stopping their runs early. Coming off a title in Newport last week is the former Univerity of Georgia All-American, John Isner. 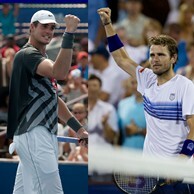 Isner reached the final last year before falling to Fish in a third set tiebreaker. The hard-serving American is perhaps best known for his 11-hour match at Wimbledon in 2010, but his run to the final in Atlanta last year helped bring him into the top 20, establishing him as a serious threat in the men’s game. Look for him to serve his way deep into the draw, perhaps riding his success in Newport to a possible title. Rounding out the top 4 seeds is the X-Man, Xavier Malisse. The Belgian has spent 13 years on the ATP World Tour and has appeared in 12 finals, winning three. He has had success on the doubles side, as well, winning five titles including The French Open in 2004 and the Masters 1000 event in Indian Wells earlier this year. Other tour veterans in the draw include Lleyton Hewitt and Tommy Haas, former world No. 1 and 2, respectively. Hewitt has 28 career ATP World Tour titles including Wimbledon and the US Open. An injury-plagued 2011 has seen a drop in his ranking, but the Aussie is definitely someone no one wants to see in the first round. Haas is recovering from hip surgery and calls this return his "third career" on the ATP World Tour. Don’t expect the German to go down without a fight, the four-time Grand Slam semifinalist has 12 ATP World Tour titles under his belt and knows a little something about winning. Americans occupy roughly one-third of the singles draw. Representing the Red, White and Blue is a myriad of tour vets and young guns including 19-year-old Ryan Harrison, who reached a career-high ranking earlier this month and holds wins over five top-50 players in the last year. The Louisiana native holds the record for the youngest player to win an ATP World Tour match at 15-years-old. James Blake turned pro in 1999 and was a top-five player back in 2006. His exciting play is as deadly as it is thrilling. A searing one-handed backhand and knack for creating angles and opening the court make Blake a marquee player to watch. Coming off an ATP Challenger win in Winnetka, Blake looks to be in good form and definitely not one to count out. Other Americans looking to make a statement on home soil are Atlanta native Robby Ginepri, a former top-15 player; Ryan Sweeting, who won his first career title in Houston in March; Alex Bogomolov, Jr., who is at a career-high ranking after recording wins this year over World No. 4 Andy Murray and rising Australian star Bernard Tomic; and 13-year tour veteran Michael Russell. Other dark horses looming in the draw are two-time NCAA Singles Champion Somdev Devvarman of India and 20-year-old Bulgarian Grigor Dimitrov. Both are at or near career-high rankings and continue climbing. Known as giant-killers, Devvarman and Dimitrov have wins over some of the world’s best and hope to play David to the Goliaths in the draw. At the Atlanta Tennis Championships, it’s not just about rankings or success, but about determination and heart. Whoever wants to claim the title will have to be at the top of his game, both physically and mentally. Who knows, this year could be about a top player asserting his spot among the elite, a veteran proving experience plays a huge factor in winning or a youngster making a name for himself in the Atlanta heat.